Some may argue this point, but the catcher might just have the most dynamic position on a softball team. She has more jobs than any other player -- giving signals, catching pitched balls, blocking bad pitches, throwing out base runners, catching foul balls, tagging players at home plate and fielding bunts. As a coach, you can help your catcher get better with drills that focus on blocking, agility, quickness and strength. Have your player wear her catcher's gear and get into her normal crouched position behind the plate. She must keep her hands behind her back throughout the drill. Stand 25 feet away from your player with a bucket of whiffle balls. Throw several low and in-the-dirt pitches. The goal is to teach your catcher to drop to her knees and block the balls using only her chest, legs and shoulders. As she gets better, use regular softballs. Improve your catcher's agility, foot speed and throwing accuracy with a bunt-fielding drill. 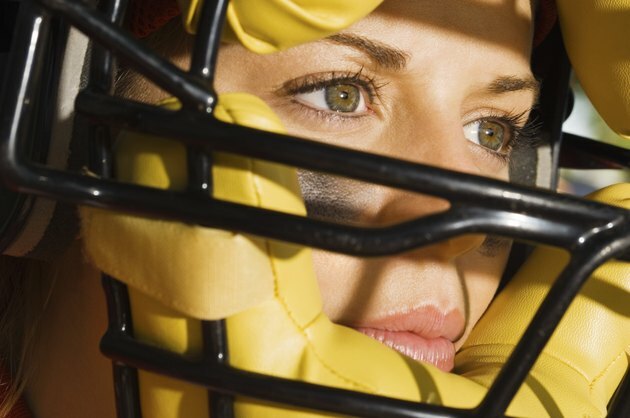 With your catcher wearing her gear, have her take her normal position at the plate. Stand behind her with several balls and roll a ball either toward first base, the pitcher's mound or third base. The goal is for your catcher to quickly field the ball and throw the ball to first base.